Israel says it arrested eight Palestinians during a raid in the town of Jenin in the north of the West Bank. 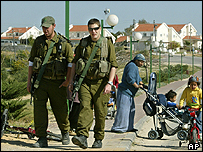 Israeli security sources said the men were militants involved in making rockets for attacks against Israel. The raid was a rare invasion into a West Bank city by the military, which said it would carry out only essential operations after a truce in February. It came as Israeli MPs were due to vote on holding a referendum on a pull-out from Gaza and parts of the West Bank. Israeli Prime Minister Ariel Sharon, who already has parliament's backing for the July pullout, has said the move is a delaying tactic. Opinion polls consistently show a majority of Israelis favour leaving Gaza, which Israel has occupied since 1967. Unnamed Israeli military officials said the arrested men belonged to the militant group, Islamic Jihad. However, residents told the Associated Press news agency that three of the men, arrested in a nearby village, were members of Palestinian security forces, and that the other five were not known militants. An Israeli soldier was wounded by an explosive device during the operation. Jenin is known as a stronghold of Palestinian militias which have sent suicide bombers to Israel.